Pinocchio is visually gorgeous with good, if heavy-handed moral teachings. It can be scary for kids and has a grim overall feel. I appreciate it but I can’t give it my highest rating because of how I know it affected me as a child. So I gave Pinocchio a B+ and I’ve gone back and forth on it ever since. In many ways the issue is the same with Toy Story 3. 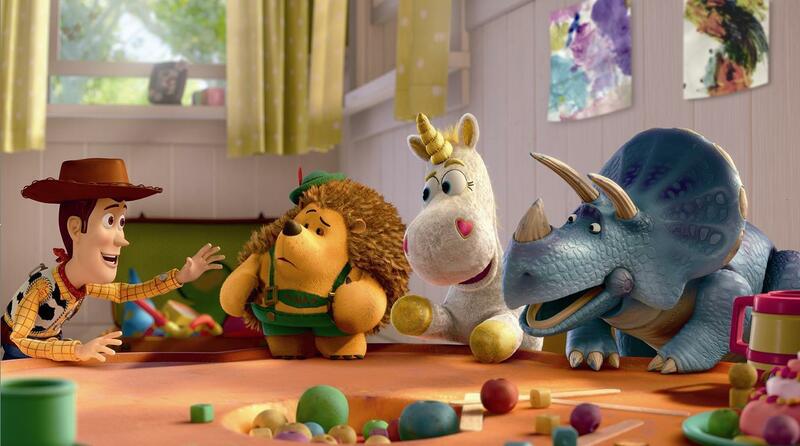 How much does a child’s opinion count in reviewing an animated film? We know that animation isn’t just for children but in the same breath if they don’t like it isn’t that a problem? I don’t know. I honestly can’t decide. What do you think? Anyway, in the end I can only review a movie based on what I think of it. At least with the Pinocchio review I was taking into account only what I thought of it as a child not other children. I don’t have that luxury with Toy Story 3. But I didn’t let anyone else’s opinions affect any of my other reviews so why should my nieces feelings be any different. I’m just going to tell you what I think. So here goes. I love Toy Story 3! I mean this was me after watching it yesterday! And yet I was also laughing and enjoying the tense moments so it isn’t just a cryfest. It may just be the best 3rd installment in a franchise ever. Return of the King, Indiana Jones and Last Crusade may be better but that’s all I can think of. Can you? 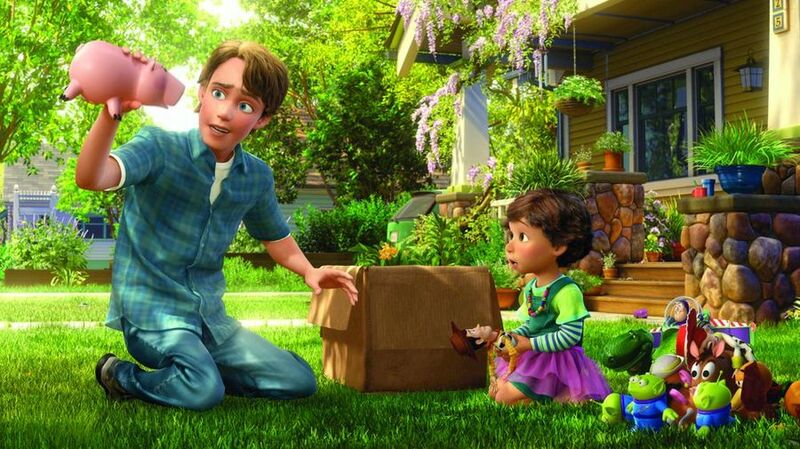 Anyway, in this film we are 11 years after the events of Toy story 2 and just as you might expect Andy has grown up and is off to college. 1. Andy’s Toys are a family and while they’ve lost some they stick together as best as they can. 2. That Andy will play with them one more time. But both seem like an impossibility because Andy wants to take Woody to college with him and the rest are accidentally sent to a daycare center called Sunnyside as a donation by Andy’s Mom. At first the daycare seems like a pretty great setup for the toys. They will get played with again after 10 years in dust and that seems pretty great. They are also welcomed by the leader of Sunnyside, a bear named Lots-O (for Lots-O-Huggin’ Bear) voiced by Ned Beatty. 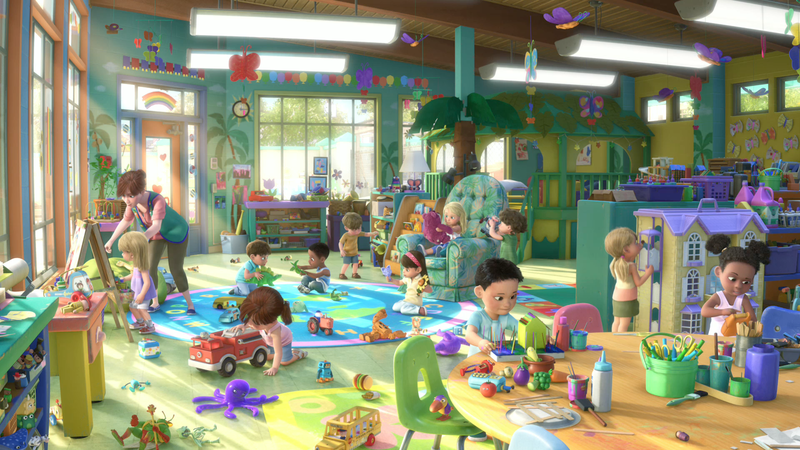 Unfortunately all is not sunny at the daycare and the next section of the movie turns into a prison escape story but it never gets serious for too long. Most of the humor comes from Buzz who gets put on his Spanish setting (so funny!). And Michael Keaton is also hilarious as the Ken doll who falls instantly in love with Barbie and is very concerned with his wardrobe. There is also humor from a little girl named Bonnie’s toys who fancy themselves a kind of theater group. We also learn from these toys the true story about Lots-O and how he came to run Sunnyside like a jail. I still can’t believe they cut it that close but it is incredibly gripping if way too intense for my nieces! I completely get their response because I also feel tense watching it. How can you not? 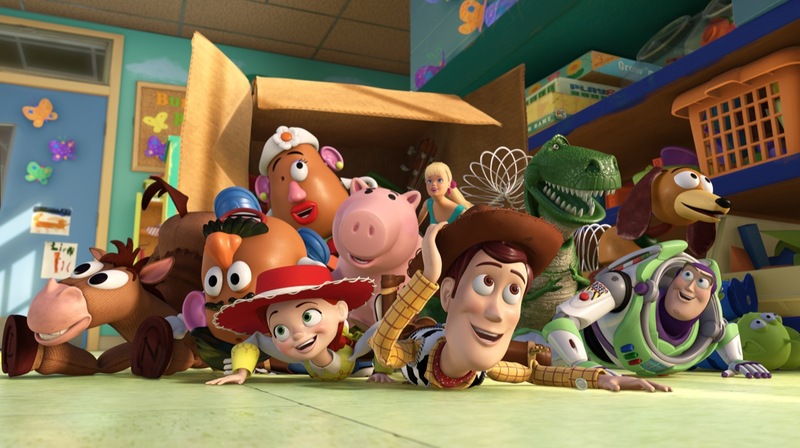 With the prison escape done we get the end of the movie which is Andy’s chance to say goodbye to his childhood and for the toys, especially Woody, to say goodbye to him. Pixar is so great at these type of emotional, life changing moments and this is one of the best. Some may say it is unrealistic for a college student to play with his toys one last time but I don’t think it is. Maybe in a previous era it might have been but this is the era of adults trick-or-treating and dressing up for comicon. This is the era of grown men collecting Funko dolls and displaying them proudly. I’m not the most nostalgic person in the world but even I have dolls displayed proudly in my room and I’m 34 years old. If I had to give them up I would cry because my Grandma gave them to me. There’s no reason to assume Andy would be any less attached to these toys. But even if you set that reality aside saying goodbye to the toys is symbolic of Andy saying goodbye to his childhood and I think he knows that. In many ways it is kind of like the end of the Many Adventures of Winnie the Pooh when Christopher tells Pooh that he can’t do nothing any more even though it is what he loves most of all. Plus, in this final scenes we get the fulfillment of the 2 promises made at the beginning of the film creating a nice sense of closure to the film. Just as we were promised Andy plays with the toys one more time and they all stay together because they are a family. Love that. That is the ending of Toy Story 3 and it is an emotion almost anyone can relate and respond too. In a way you could call it the great necessary evil of life. Despite what Peter Pan wants we all must eventually grow up. 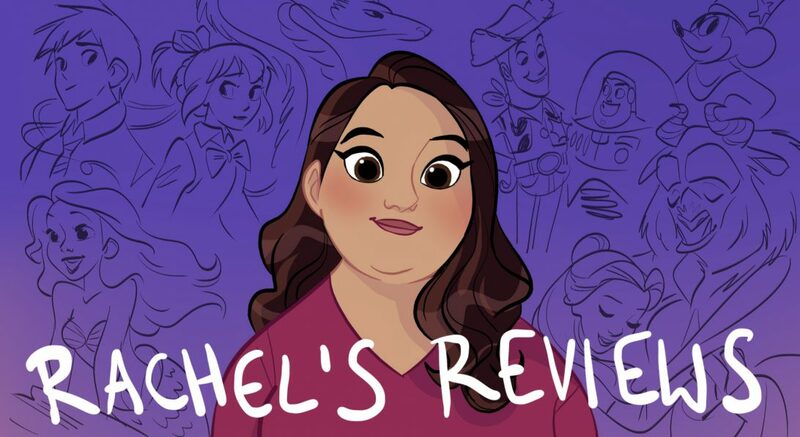 It practically goes without saying the animation is stunning- bright and colorful, with a clarity and realism to all the characters I haven’t seen in Pixar till this film. Also the voice work is top notch with all our familiar characters and new voice actors such as Keaton, Beatty, Whoopi Goldberg, Timothy Dalton, Bonnie Hunt and Jeff Garlin. 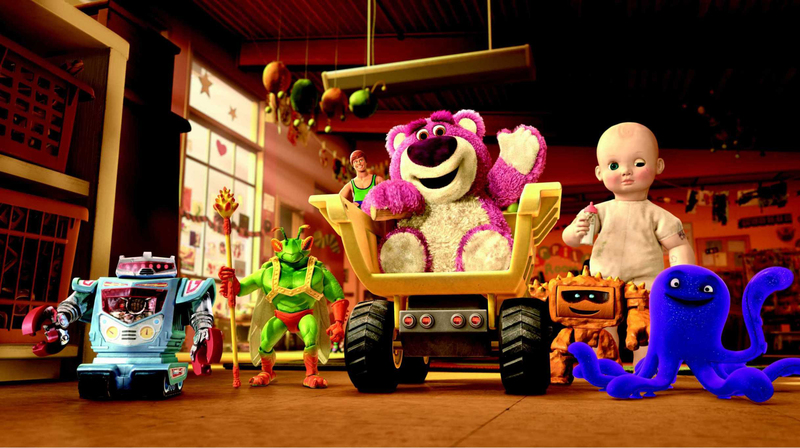 Everyone involved in Toy Story 3 did an amazing job. And for the record I have faith they have a good idea for Toy Story 4 and it will be good. It is not going to be a continuation of the Andy storyline but exist solely in the world of the toys, a romance I’ve been told. John Lasseter is directing 4 so sign me up! I do think this may be the best 3rd film in a trilogy, maybe alongside BTTF3 (my fave films of all time, if I haven’t told you that already). Yeah, I know it can get too intense, but I guess that’s what makes me like it. And if kids don’t like it, I feel that doesn’t really have anything to do with the movie being “good” or not. Oh good one with Back to the Future. Another very strong 3. I think you might be right about the kid angle. For some reason I think an animated film with a few exceptions should be liked by kids but these are just 3 kids and in end have to go with what I think or it opens a rabbit hole of inviting other people’s opinions in my blog. I go back and forth between whether I like Toy Story 1 or 3 better. This is such a great film. Did you mention how old your nieces are? My cousins were maybe 6 when they saw this movie and they loved it, so I’m sure it affects kids differently too. 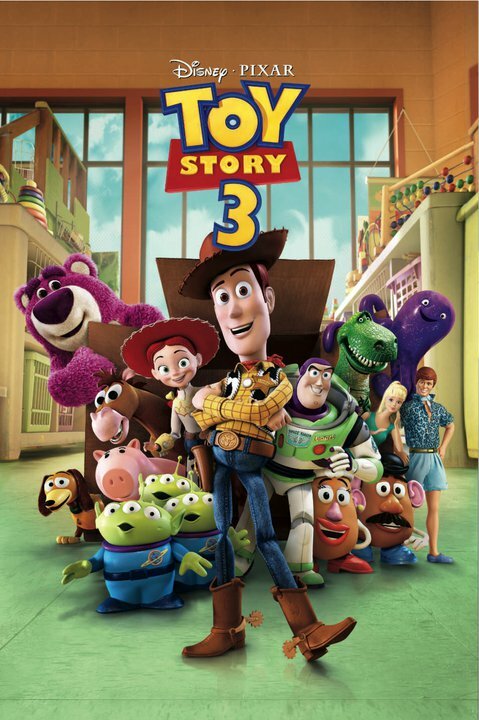 I think I tend to favorite this one as my favorite Toy Story because I feel like it’s such a great conclusion to the series (even though 4 is coming out… this really just felt like it tied everything together so nicely). It’s the same reason why Deathly Hallows is my favorite Harry Potter book. Let’s see. They are 11, 9 and 7 now so they were pretty young back in 2010 so you might be right. I completely agree it is such a great conclusion to the story. Harry Potter 7 pt 2 is a great comparison because everyone gets their moment in that film. It’s probably also my favorite Harry Potter book but those books all mesh together for me and I forget what is which one. Anyway, I would still rather they weren’t doing a Toy Story 4 because this does conclude everything so well but I just have to believe they have something great if they are doing it. Even Cars 2 which people hate is very inventive and creative. I mean who would think of secret agent cars? So they had an idea and whether it was executed perfectly is another question. I just have to believe they have an idea that is worth doing to risk Toy Story 4. But we will see. In meantime we have Toy Story 3 and it is a great movie. It was even better than I remembered and I kind of wish I had put it a little bit higher on my top 50 ranking- a sentiment I am sure will happen many times over the next little bit as I did not rewatch every movie before making that list. Oh well, what are you going to do! Honestly, I like this one the best of the three as well. I was definitely not expecting Lot-Do to be the villain though. But hey, every good story has to have a villain, right? Anyway. Just curious, do you agree with say “We Belong Together” winning the Academy Award for Best Original Song, or do you think “I See The Light” from Tangled should have won instead? I’d have gone with I See The Light since that one is probably a more emotional song. Yeah, I wouldn’t put the songs in Tangled up there with the songs in say Lion King, Little Mermaid, or even Frozen. Still, I enjoy them anyway. But with that said, it’s not the easiest Toy Story movie to revisit, and it certainly is a stronger film with the two preceding films. I imagine that if you were a kid watching this film for the first time and having not seen the other Toy Story movies you’d feel a bit lost and confused, and understandably scared, and I do feel that this movie is targeted primarily at the people who watched the originals in the 90s and had since grown up, which might limit its accessibility. The ending is especially powerful as the theme of accepting death and facing it as a family is a powerful message, still the filmmakers handled it very well. But I’m sure that’s not a problem for most teens or parents as the trilogy is universally loved. Even the scene with Andy playing with Bonnie at the end, I don’t really see it as creepy as some (like Doug Walker) would claim, I guess it is unusual because most teenagers aren’t this attached to their toys and therefore need to build them up to little children. But for me it gets a pass. I sure as heck hope that Toy Story 4 is a great film; and if they do pull it off it will be an impressive feat. The funny thing about Doug’s review is I think if we had visited his dorm room in college there would have been plenty of toys. Just a sneaky suspicion. (I like Doug but he seems to find flaws with every movie and sometimes it is a reach). But anyway, I think you are right on about it dealing with grief, loss and change as a family being the theme of Toy Story 3. This is a theme of many Pixar films and probably because it is a theme of life. The Toy Story characters became an important part of many of our childhood and so the ending is a chance for us all to say goodbye (and Woody also). I think it is pitch perfect. Too intense for some kids but you are right perhaps that’s not who it is primarily made for? Thanks for your amazing comments btw. I do think that if I was a parent I wouldn’t say no if my child really wanted to watch Toy Story 3, even if I knew about the climax. But I do think the impact that scene has is infinitely stronger with the two prior films backing it up and over ten years worth of nostalgia, at least speaking as a 90’s kid. But overall, I wouldn’t change a single thing in this film. Oh I would definitely let them watch it but it depends on the kids a little bit. Maybe talk to them after or prepare them for the incinerator scene if it will upset them? I dont know but I would definitely let them watch it. Pingback: Did the Right Film Win? 2010 Animated Oscars | Reviewing All 54 Disney Animated Films And More!